Stay in a Hotel made entirely from Salt! Brave the World's Most Dangerous Road on a mountain bike! See the Sun rise over the greatest salt flat in the world! Discover Lake Titicaca and the Sun Island! Torotoro, Where the Dinosaurs walk with You! 7 sites not to miss in Sucre! Even though it is surrounded by some of the most popular destinations in South America, such as Argentina, Brazil, and Chile, the small, the landlocked country of Bolivia stands out as a top travel destination for many reasons. The diversity of the landscape, its colorful indigenous heritage, nature, wildlife and opportunities for extreme adventures offer a wealth of once-in-a-lifetime travel experiences. It is not a question of whether to include Bolivia in your itinerary. Rather, it’s a question of knowing which sights and experiences you simply cannot miss. Many people think of Bolivia as primarily Andean country or think of Lake Titicaca or the Uyuni Salt Flats first. What they do not know is that the Andean region covers less than a third of Bolivia. Don't miss out on the other two-thirds of the country with beautiful tropical destinations such as rainforests and waterfalls, amazing national parks, the largest city in Bolivia, wonderful historic sites, all influenced by some of the less known ethnic groups in Bolivia such as the Moxos, Guarayos, Ayoreos, Guarani and Chiquitanos. Bolivia is safer than the neighboring countries and provides budget-friendly options for traveling through different areas of the country. Bolivia offers a lot for adventure seekers, as well as those set out to explore something new and mostly unseen. From the high peaks of the Andes mountains, the mind-blowing salt flats in Uyuni, to the hot and sweaty jungles of the Amazon, Bolivia has a little bit of everything. The Uyuni Salt Flats (Salar de Uyuni) located at about 3800 meters above sea level amid the Andes in southwest Bolivia, is the largest salt flat in the world. The salt was deposited here after a prehistoric inland ocean dried out, leaving behind a nearly 11000 square kilometer (about 4086 square miles) vast blinding white salt desert up to 120 meters deep. The Uyuni Salt Flat is the most popular tourist attration in Bolivia, one which must be seen to be believed. To get to Uyuni, you can fly (via La Paz), take a bus, train from Oruro, or a private transfer from Sucre or Potosi. The town of Uyuni, located at an elevation of 3656 meters, is the starting point of all tours to the world-famous salt flats. One of the flattest places in the world, a trip here feels much like a trip to a strange and beautiful new planet. In fact, the Uyuni Salt Flat is featured in Episode 8 of the Star Wars saga, so don't forget to bring your X-wing or TIE-fighter for super fun photo opportunities with majestic backdrops! During the rainy season ( November to March) the water accumulates on the salt and creates a giant mirror that perfectly reflects the sky and clouds above and you can play with the optical illusions the lack of horizon causes. With nothing in sight for miles, taking “perspective pics” has become a popular pastime for tourists and photographers. When visiting Uyuni, you can choose to stay at an actual salt hotel where everything right down to the furniture is made completely out of salt bricks! 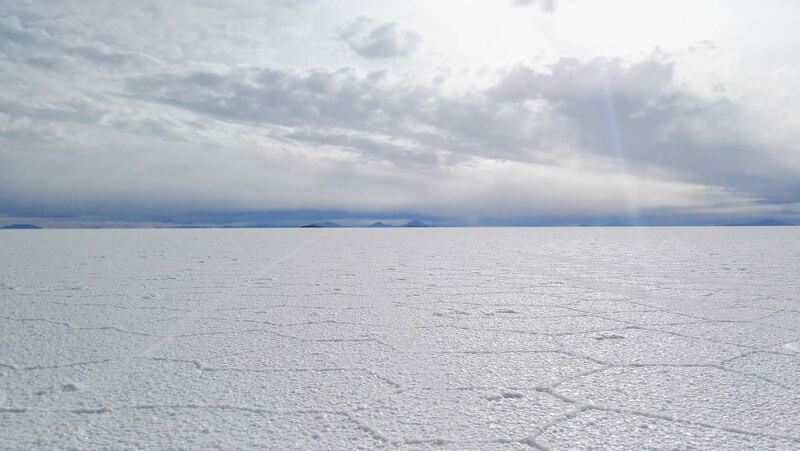 By taking an organized, shared or private tour of the Uyuni Salt Flat and the surrounding region, you will get to see natural wonders such as geysers, islands in the salt studded with giant cacti, red, blue, white and green colored lagoons (and a rather stinky one), hot springs, painted mountains, bizarre rock formations, active volcanoes and exotic animals such as pink flamingos as well as the endangered vicuña and andean fox. The Salt Flats themselves are the definite highlight of the tour, but they only constitute one of the three days of a typical trip. Other-worldly landscapes await you on this indescribable 4x4 jeep trip through scenes out of a fantasy land. Train cemetery. In the 19th century, big plans were made to build a bigger network of trains out of Uyuni, but the project was abandoned because of difficulties and tension with the indigenous residents. The trains and other equipment were left to rust and fade out of memory. Isla Incahuasi, Inkawasi or Inka Wasi is a hilly and rocky island in the middle of Uyuni Salt Flat (Salar de Uyuni). It is famous for the hundreds of giant cactii growing on it, as well as the spectacular panoramic views of the salt flat surrounding it. The Eduardo Avaroa Andean Fauna National Reserve is home to some of the planet’s most unusual landscapes that offer refuge for many rare and endangered South American species including several large colonies of flamingo and vizcachas (a squirrel / rabbit like animal). Licancabur is a stratovolcano on the border between Bolivia and Chile, south of the Sairecabur volcano and west of Juriques. It overlooks the Green Lagoon. Laguna Hedionda (Stinking lagoon), is a volcanic lake on the way to the Eduardo Avaroa Reserve. The water has a high gas content and smoking is strictly forbidden nearby. The Rock Tree is a tree-like rock formation in the desert that offers great photo opportunities! The Sol de la Mañana ( Morning Sun) Geiser, is a geothermal field that xtends over 10 km², between 4800 and 5000 meters above sea level. One of the must-sees while traveling in South America is a trip to the Amazon jungle to get up close and personal with a myriad of wildlife. Did you know that the Amazon Rainforest basin spills into parts of Bolivia? In fact, this area of the Amazon is a rich region full of tranquil, virgin forests. Much of it is relatively unexplored, making it the perfect, peaceful place for you to wander. Madidi is a national park located to the Northeast of La Paz in the upper Amazon river basin in Bolivia. Established in 1995, it has an area of 18958 square kilometres and is one the most biologically diverse parks in the world with 5000 to 6000 species of flora. The Madidi National Park starts in the Andes and stretches all the way to the Amazon. Spread across an area of 7000 square miles, it is extremely popular among tourists. You may spot a jaguar, titi monkeys (a species of monkey found nowhere else in the world), exotic bird species (around 11 percent of the planet’s 9,000 species of birds can be found in the Madidi National Park), or the giant otters that call this forest their home. The best way to experience Madidi National Park is through one of the many ecological and cultural tours providing an authentic and safe jungle experience. Tours are based out of Rurrenabaque, about 20 hours by bus (one of the worst trips in South America) north of La Paz, or a 45 minute flight. If seeing wildlife is your goal, then a Pampas tour is for you. You can go slowly down the river in a canoe, with literally hundreds of alligators, crocodiles, turtles, monkeys, pink dolphins, capybaras, and abundant species of birds all around. Activities can include piranha fishing, swimming with pink river dolphins and hiking in the jungle in search of the largest snake in the world, the anaconda. Taking the Jungle tour, Traversing the rugged terrain, you will come across winding rivers, rolling grasslands, mosquito laden lakes, steep slopes and possibly the seldom seen indigenous people of the tropical rain forest. 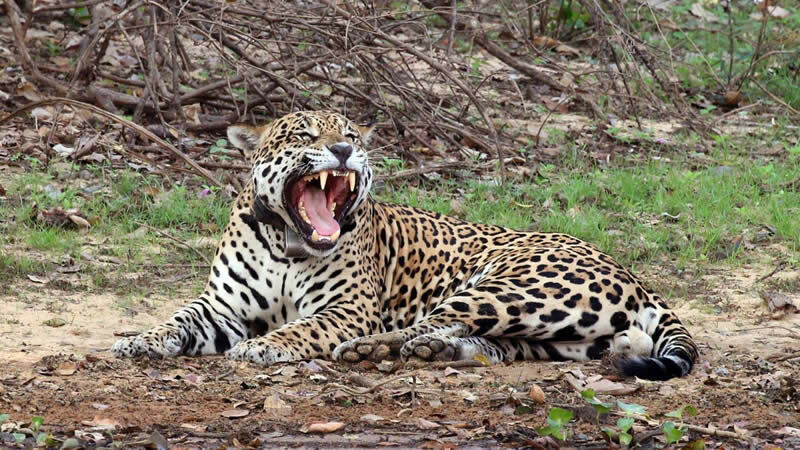 Whether it’s spotting a jaguar, smelling the scent of a rare type of flower, learning about the different medicinal plants, or listening out for the chirps of more than 1000 species of bird, this national park has something to offer to every nature lover. Shared between Peru and Bolivia, Lake Titicaca is famous for being the highest navigable lake in the world. It is also one of the largest lakes in the world with 3,232 square miles of water and South America's second largest freshwater lake. With an average height of 3810 meters above the sea level the Titicaca Lake is a great tourist attraction for nature and history lovers. 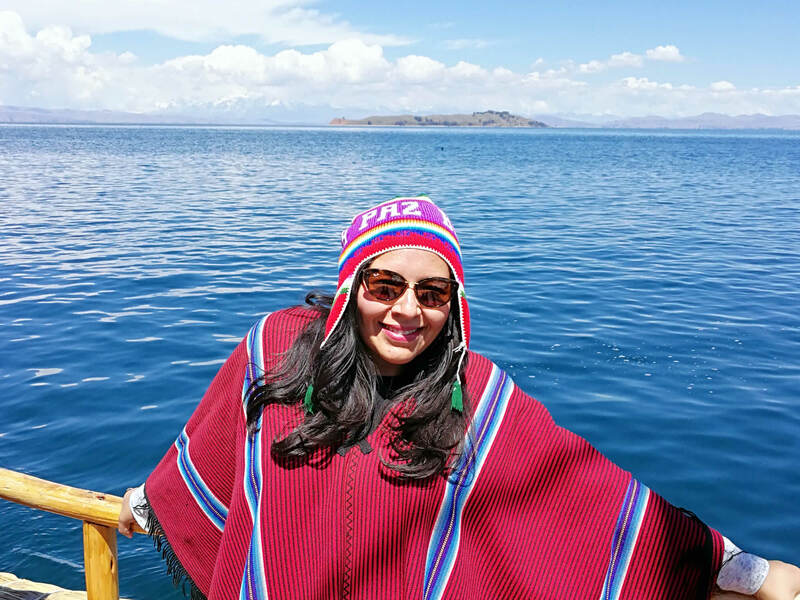 As one of Bolivia’s most beautiful and treasured landmarks, Lake Titicaca is a place for great picture opportunities. The Incas and a number of other native peoples are thought to have originated in the region and there are a number of ruins nearby on the shores and the islands, including the temple where the Inca emperor used to stay when he visited this sacred site. On the shores of Lake Titicaca sits the charming town of Copacabana. Travelers flock to this resort town to soak in stunning views of the radiant blue-turquoise waters of Lake Titicaca. This original Copacabana is a favorite resort for both tourists and locals. There are many options for exploring the lake. 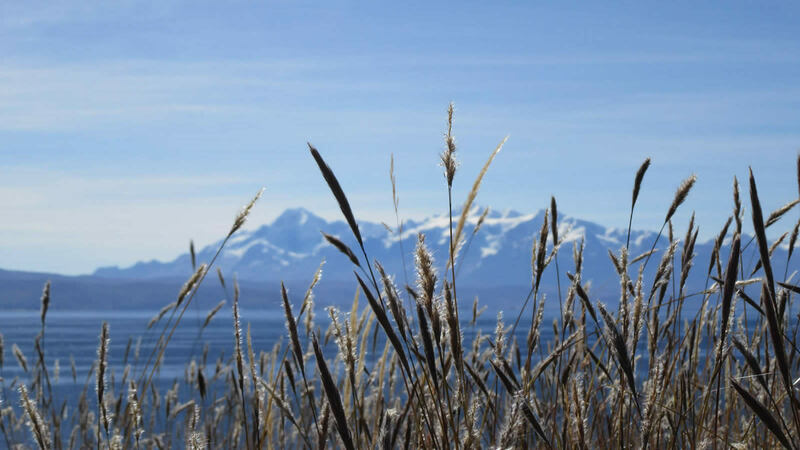 Hiking the trails along the shore is a great way to see the lake from different perspectives, with white snow capped mountains in the background. Kayaking or paddle-boating your way around the bay gets travelers up close and personal with Lake Titicaca. For lunch or dinner savor some freshly caught Titicaca trout (trucha) on the shore. It doesn't get fresher than water-to-grill. Copacabana itself is a treat to explore, with many shops, restaurants and bars lining the main streets. Visit the Basilica of Our Lady of Copacabana, a 16th-century Spanish colonial shrine that houses the image of the Virgen de Copacabana. Climb to the top of "Calvary" hill (Cerro del Calvario), which has seven stops - the seven stops Jesus made as he walked with his cross on his back to his crucifiction. If you make it up to the top, you'll be rewarded with one of the most beautiful views of the lake and the surrounding snowcapped mountains. From here you can observe Lake Titicaca in all its glimmering glory. Your visit to Lake Titicaca would not be complete without a boat trip to one of the islands in the middle of the lake. This can easily be done on a shared or private full day tour. The Sun Island (Isla del Sol) is a Bolivian island in Lake Titicaca. One of the best ways to grasp the sheer magnitude of Lake Titicaca is to take a boat trip from Copacabana. Here you will discover ancient Inca ruins scattered throughout the island as well as Aymara villagers busy farming the terraces and tending to the sacred sites. The island is crossed by hiking trails and Inca sites like Pilko Kaina, with its ruined palace. Walking from one side of the island to the other is a cathartic experience and one which will allow travelers to witness some of Bolivia’s most breathtaking scenery. In nearby Yumani village on the south side of the island, the Stair of the Inca (Escalera del Inca) leads up to the fabled Fountain of Youth or Three Waters. You can choose to sleep over on the Sun Island instead of going back to Copacabana and experience a unique sunset and sunrise over the lake. Anything you choose will make for a fantastic visit, especially with the beautifully blue water shimmering beneath you. The Moon Island (Isla de la Luna) is a smaller island close to the Sun Island. It used to be a monastery for the virgin priestesses, known as ñustas, with some of the ruins of their temples still standing. Then there are also the floating islands of Uros where the indigenous people still live on floating, handmade totora-reed islands. The National Park Sajama is the oldest national park in Bolivia, located to the Northwest of Oruro. It borders Lauca National Park in Chile. 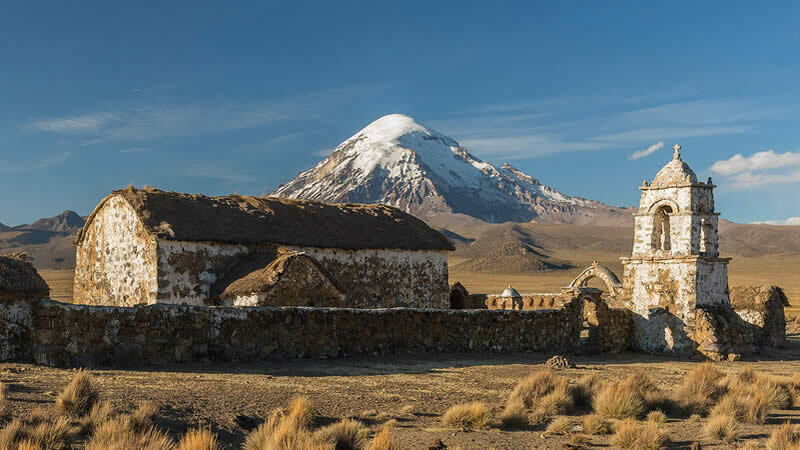 Featuring the imponent Nevado Sajama peak (Bolivia's highest), thermal water, scenic lagoons and andinism routes, it is a prime location for photographers and nature lovers. Covering over 1000 square kilometers, the park's extensive plains are home to herds of vicuñas, alpacas, llamas, the highest forest in the world, unique artifacts, indigenous burial sites (Chullpas), cave paintings, small adobe churches and mysterious lines. The climate is semi-arid and cold. Since altitudes rech over 4000 meters above sea level, a period of acclimatization is advisable before touring the region. Not to miss: bird wathcing near the Lauca river, climbing the Sajama volcano, a bath in the hot springs of Huayna Sajama, the town of Tomarapi, the colonial church located in Curahuara de Carangas - also called the Sistine Chapel of the Andes, observing the Aymara culture and every day life and photographing the unique wildlife. Oruro is an unwelcoming mining town located at dizzying heights in the arid Altiplano region of Bolivia, about 3 hours from La Paz. Nevertheless, once every year it is home to one of the most famous festivals in all of South America. The Carnival of Oruro, held each year on the Saturday before Ash Wednesday in devotion to the Virgin of Socavon, is one of the largest folkloric and cultural events and festivities in Bolivia and Latin America. The carnival features nearly 20 hours of continuous partying with 30000 dancers and about 10000 musicians performing the many folkloric dances of Bolivia in extravagant costumes with beautiful crafts to lively music. The carnival in Oruro always begins with the diablada (devil dance), which is considered to retain most of the artistic expressions from pre-Columbian America. The Oruro Carnival is one of Bolivia’s most popular tourist attractions, with crowds of up to 400,000 people annually. 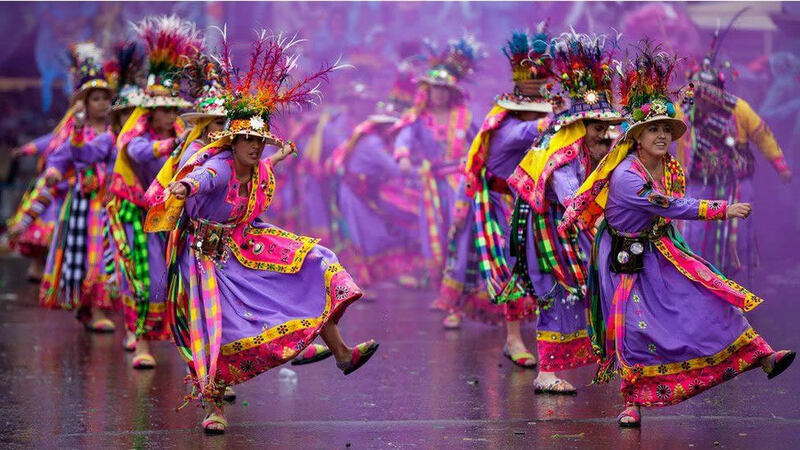 If you are travelling in Bolivia at this time of year, Oruro Carnival is one fiesta not to be missed! 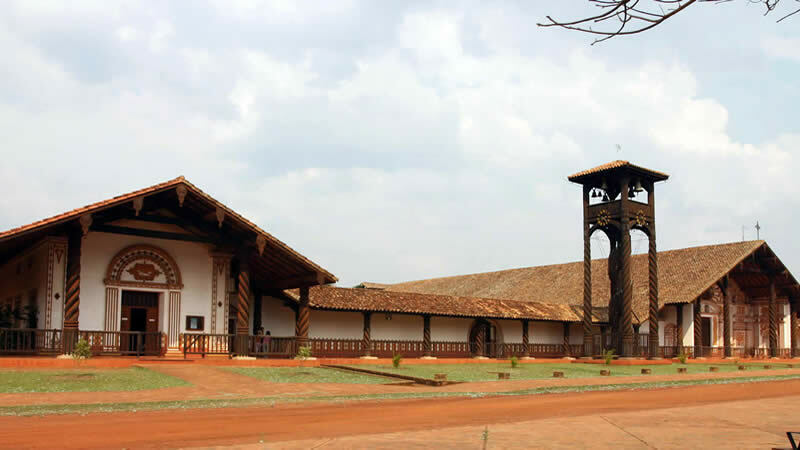 The Jesuit missions of the Chiquitania Region in Bolivia, slightly off Bolivia’s tourist trail, have remained intact and even after hundreds of years they continue to marvel visitors. They are located on the eastern lowlands of Bolivia, about 6 hours from Santa Cruz city. The six mission towns were founded by a handful of Jesuit priests in the 17th and 18th centuries and amazingly still remain a vibrant cultural force. They can be visited in one long tour. The largest and best-known is San Jose de Chiquitos, but all provide a beautiful example of old Spanish colonial architecture. As one of Bolivia’s most beautiful attractions, the Chiquitania Region is a must see for anyone who likes history, nature and the outdoors. 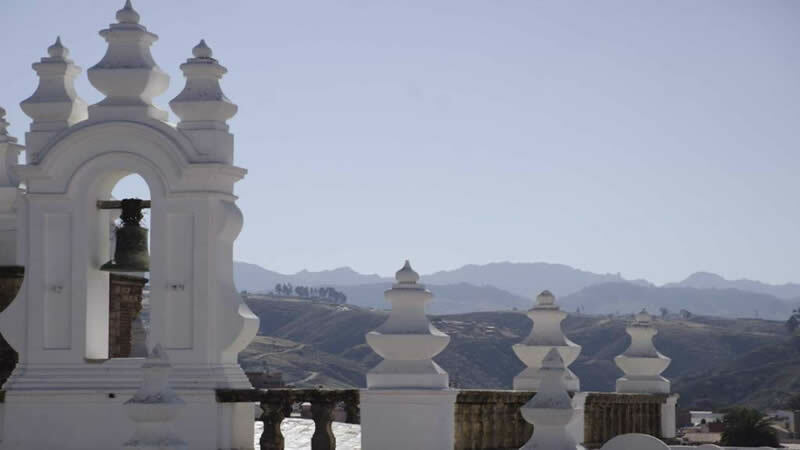 Established in 1545, Potosí is the world's highest city at approximately 13400 feet. It became one of the world's richest and most populated cities for a while thanks to the enormous amount of silver mined from the nearby Cerro Rico (Rich Mountain) mountain. In Potosí the two most interesting things are the mines of Cerro Rico and the Casa de la Moneda (House of Coins), the old royal mint. Cerro Rico. From the depths of this amazing mountain, huge amounts of silver have been extracted since 1545. This mountain lured many Spanish Conquistadors to come after its silver. Currently, tin is mined as the silver deposites have been mostly depleted after nearly 500 years of continuous mining. You can take a guided tour of the mines where countless workers lost (and still keep losing) their lives extracting silver and tin from the mountain’s veins. The Casa de la Moneda (the Spanish Mint) is an extremely interesting museum. It was here that the Spanish turned most of the silver into imprinted silver coins before sending shiploads of them to Spain. The rest of the city is also very ancient and colonial. The city of Potosi is also home to Bolivia's oldest colonial church, the Church of San Fransisco, which was built by the Spanish in 1547. 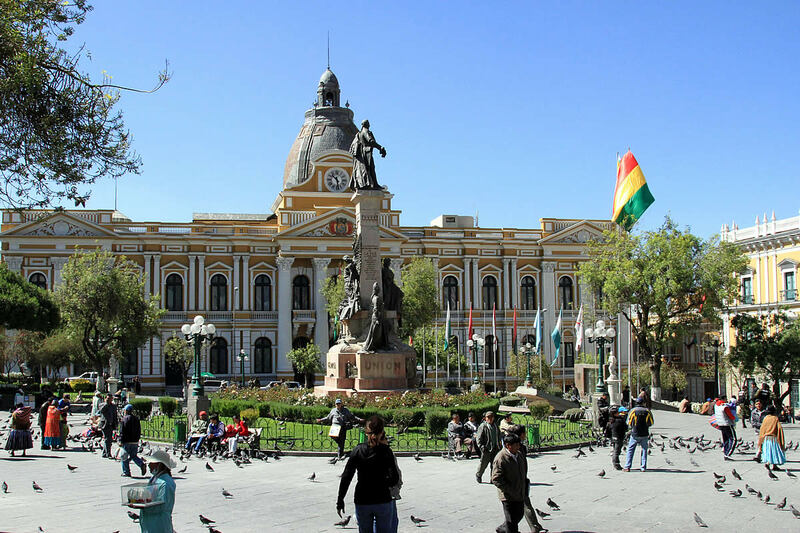 La Paz is the seat of government in Bolivia and a great introduction to the diversity of Bolivia. 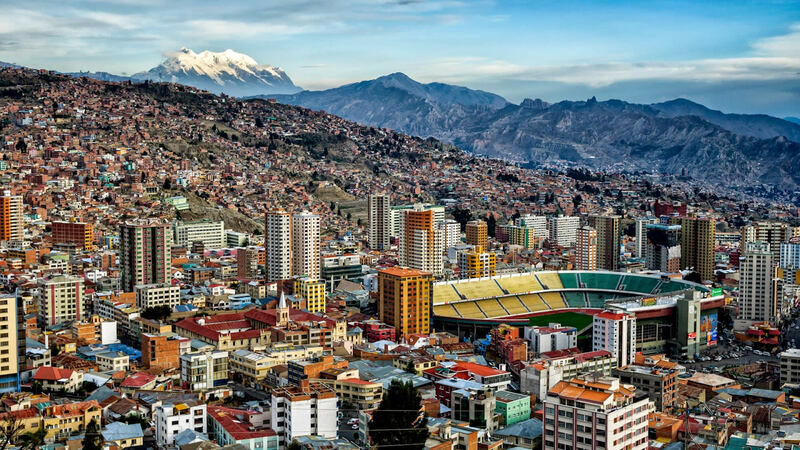 The city sits in a crater of clay and sandstone surrounded by the tall mountain peaks of the Altiplano and the majestic Illimani towering over it. The city’s new urban cable car system is the highest in the world. The neighboring city of El Alto houses the world’s highest international airport at 4058 meters (about 13300 feet), while the lower and more affluent residential area is still at about 3100 meters (10170 feet), so La Paz is best explored at a slow pace. There are countless museums and cultural activities to visit and experience. At Plaza Murillo in the heart of old town, where the government palace is located, you can see the changing of the guards in the morning at around 10 am. The Witches Market and the San Francisco Cathedral (a monumental 18th-century church featuring ornate carvings and panoramic rooftop views) is a definite must to visit. The Mercado de las Brujas (Witches' market) is known for vendors selling dried llama fetuses and other magical remedies and potions. This is a good place to buy one-of-a-kind souvenirs or even to get your fortune read from coca leaves. The Witches’ Market is located in a touristy shopping area in the city center, allowing a visit to fit into a full day’s itinerary. Calacoto, in the southern half of the city, is an area filled with upscale neighborhoods full of upscale discotheques, boutiques and stores, malls, gyms, movie theaters, and lots of other stuff. The Mirador Killi Killi is a hilltop destination featuring spectacular panoramic views of La Paz. The Valle de la Luna (Moon Valley) is situated about 10 kilometers from downtown La Paz. It consists of an area where erosion has created a moon-like landscape. There are narrow walking trails in the valley and you can take fantastic pictures. A trip to the Valley of the Moon is a great day trip. Be careful as the soil is soft and breaks away easily. Take a picnic and spend a some time enjoying a good hike. Calle Sagàrnaga and Calle Jaen are steep, narrow cobblestone alleys lined with brightly colored colonial houses, cafes and museums. The National Park Toro Toro located to the north of Potosí is a paradise for the lovers of geology and paleontology and one of the most beautiful National Parks in Bolivia. Among the attractions are the tracks of dinosaurs, the cavern of Umajalanta, Inca ruins, cave paintings and the impressive canyon of the Valley of Toro Toro. The altitude of the park varies between 3600 and 1900 meters above sea level. The village of Toro Toro is located on a plain surrounded by mountain ranges of Huayllas and Condor Khaka and maintains its colonial charm and architecture. The Umajalanta cave, one of Bolivias biggest, is located 8 kilometers outside the village.Stalactites and stalagmites decorate its interior. El Vergel is a series of waterfalls located three kilometres from the village that created a 100 meters deep canyon through erosion. The water falls down from the side of the canyon covered by lush vegetation and forms pools of crystal clear water at the bottom of the canyon. The stone house (Casa de Piedra) also called "Pachamama Wasi", is a museum of creative handcrafts made from stones and fossils from the surroundings area. Petrified dinosaur tracks are scattered all over the plain of Toro Toro. Cave paintings can be found near the edges of the river Toro Toro. According to the studies, the paintings were an instrument of communication for the prehistoric nomadic people. 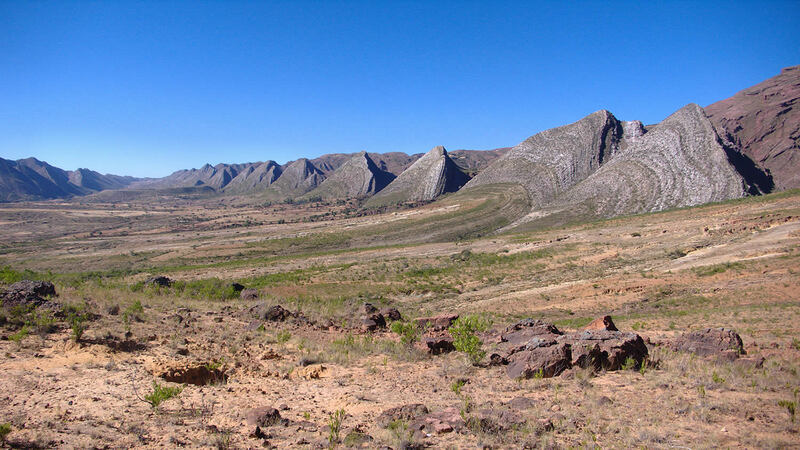 The Garrapatal canyon is an incredible sight, over 400 meters deep from the top to the bottom! This canyon is larger than the El Vergel canyon and ideal for adventure tourism. Tiwanaku or Tiahuanaco is an ancient pre-Columbian city in ruins near the south-eastern shore of Lake Titicaca, about 72 km (44 miles) west of La Paz. Tiwanaku is a recognized World Heritage Site. Once the seat and ceremonial center of the Tiwanaku culture, the city was built from stones weighing more than 25 tons from the other side of the lake. The community grew to urban proportions between the 7th and 9th centuries, becoming an important regional power in the southern Andes. At its peak the city had between 15000 to 30000 inhabitants. With only a small part excavated, Tiwanaku remains an enigma. The Akapana pyramid is the largest building in Tiwanaku. It is 194 meters long and 182 meters wide, built on seven overlapping levels. It probably was a temple dedicated to the Sun God. 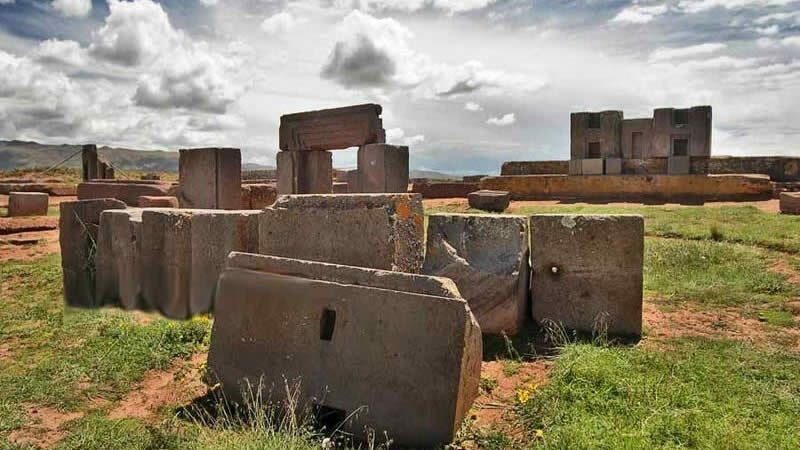 Pumapunku or Puma Punku is a terraced earthen mound that is paved with blocks best known for its massive stones and for the extraordinary precision of their cutting and placement. The Gate of the Sun (Puerta del Sol) is a solid stone arch made from a single block of stone. The Kalasaya is a rectangular enclosure with a central sunken court and carved stone heads protruding from the walls. One of the most popular activities in Bolivia is a mountain bike ride down the world's most dangerous road, also known as the Death Road. Originally built in the 1930ies by prisoners from Bolivia's war with Paraguay, this narrow and winding road descends from the heights of La Paz ("La Cumbre" located at 4650 meters above sea leel) to the forest region known as the Yungas at around 1200 meters above sea level. Before a new, safer road was built for use by vehicles, more than 200 people died each year on this “Camino de la Muerte” (Road of Death). Nowdays the old road is used by adrenaline-seeking tour groups. Due to the steep descent and sharp turns, the trek isn’t for the faint of heart and riders must constantly keep their eyes on the very narrow road which in some parts is only 3 meters wide. Most of the 80 kilometers long ride is downhill. Our friendly staff can give you helpful advice about almost anything regarding your stay in Bolivia. We'll point out things you don't want to miss, offer tips, advice, and inspiration. We are happy to show you how to get to places and guide you the logic way to plan your itinerary. We aim to help you make the most of your trip to Bolivia. 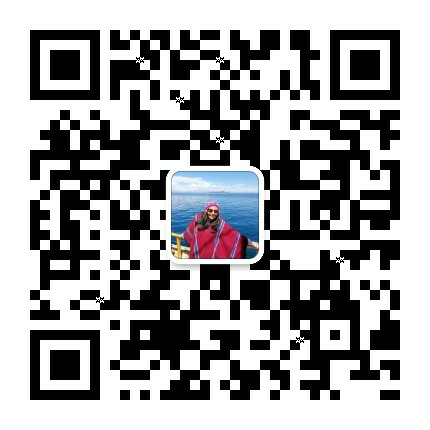 Please do not hesitate to contact us and receive accurate tourist information for Free. You can also visit our Travel Articles section or our Blog to find answers to the most common questions received from our customers.